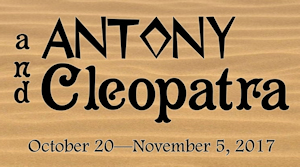 HOUSTON - Oct. 10, 2017 - PRLog -- William Shakespeare's epic masterpiece ANTONY and CLEOPATRA is being produced by the Pearland Theatre Guild at the Pearl Theater October 20-November 5 as part of its annual Shakespeare at the Pearl series, following successful productions of MACBETH, A WINTERS TALE, and ROMEO AND JULIET. Audiences will be able to enjoy this rarely produced play in an intimate space with inventive scenery, bold costumes, and a fast paced two hour production combining some of Shakespeare's most comic, poetic, and tragic scenes. Set in Egypt, Rome, and many places between, ANTONY AND CLEOPATRA follows the eponymous pair in and out of love, adventure, disaster, and eventually tragedy. Antony, along with Octavius Caesar and Lepidus, rules "one third of the world" following their defeat of Brutus and Cassius, assassins of Julius Caesar. Although married, Antony carries on a passionate affair with Cleopatra, ruler of Egypt, and a woman of "infinite variety". This affair leads to all kinds of complications: Danger from the sea by the ruler Pompey, strife and conflict with Octavius, and his own relationship with Cleopatra lead to war, strife, and the possible toppling of the empire itself. Beautiful, independent, cunning and strong, Cleopatra is arguably Shakespeare's greatest heroine, if not his greatest character. Remarkably modern for her time, she defies all odds of what a woman's place is in the world. She is played by Pearl Theater's Artistic Director, Renee van Nifterik. She is matched by Jeff Dorman, a seasoned veteran of Houston Theater making his Pearl Theater debut. Colin Brock is also debuting at the Pearl as Caesar. Shakespeare at the Pearl Veterans Jeff Merriman, Kim Roberts, Mari Tortorice, and Steve Lassiter return as well as Pearl Veterans Steve Harrison and Gage Catttoni. The cast also features talented and experienced Pearl newcomers who have acted in Houston, New York, and elsewhere: Rebecca Bernstein, Sandra Peck Ramsey, Amy-Kristina Herbert, Ain Rashida Sykes and Nkemakolam Ajiodo. .
Director Jonathan Gonzalez, a veteran of 27 of Shakespeare's 37 different plays, has a MFA in Directing from University of Houston and has been leading the company in VIEWPOINTS workshops, techniques acquired from his time in Grad school when he apprenticed under J. Ed Arazia from the award winning SITI company. The viewpoints, which provide a bold and dynamic approach to physical actor training, will go hand in hand with Shakespeare's bold and dynamic language, creating a dynamic, visceral, and colorful experience for theater goers as the company evokes and navigates vast stretches of space and time in the jewel box of a theater at the Pearl. Adults $16, Seniors and Students $14, with discounts available for groups of 10 or more. The Pearl Theater is located at 14803 Park Almeda Dr. Houston, TX 77047. Tickets are now on sale at www.Pearl-Theater.com. For questions, please contact us at (832) 459-4674.